Have you ever seen a DOI on an article and wondered what it was? DOI, or Digital Object Identifier, is a unique number given to an article to provide a persistent link to its location on the internet. The DOI is typically located on the first page of an article. A new feature of the Full Text Journal Finder tool allows you to search using the article’s DOI. Go to research.udmercy.edu, click Articles, Journals + Databases, scroll down to “Find online journals by title,” click SEARCH. You are now taken to the homepage of the journal: Review of Educational Research. As long as UDM subscribes to the journal, you will find the full text free! 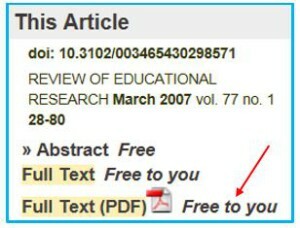 Always select the PDF as it is a photocopy of the article. You will obtain all the charts, graphs, or photos in the paper as well as the original pagination. However, be advised that not all articles have a DOI and not all databases allow DOI searching.